What I’ve done the last five days, go to Five Guys Burgers. That place is so good. I can’t stop going there. This will be my sixth day in a row. I grew up on In-n-Out. I thought that was the best burger until I had Five Guys. That is hands down the best burger I’ve ever had. T.R. Reinman, spokesman for Gaylord Sports Management, which represents Mickelson, confirmed to CNBC on Tuesday that Mickelson is in fact part of a group that has purchased the rights for Five Guys franchises in Orange County. 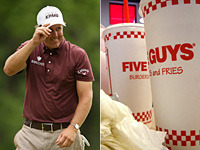 It depends on how much Mickelson will attach his name to the Five Guys franchises, but if he fully endorses the product, it could be a huge boost as Five Guys moves into In-N-Out territory. Maybe someone should check if he owns part of the Krispy Kreme franchise, too. I don’t really have a problem that he gave Five Guys a plug, but he probably should have disclosed his personal connection to the chain. But what’s really bugging me is his burger diet at The Players contradicts what he said at a Quail Hollow news conference. I believe burgers and fries have heaps of carbs. Oh, what do you know? I just came across the nutrition facts for Five Guys — a cheeseburger has 40 grams of carbs and an order of fries has 39 grams. I’m no health-guru, but that’s a lot, right? But perhaps Phil opted for the carb-free “Hamburger Beef.” That sounds absolutely scrumptious! I’m a big fan of In-N-Out and I’ve never tried Five Guys, but now I’m actually dying to taste their burger — all because of Phil’s rave endorsement. So I guess he’s a great pitchman. It better be the best burger I’ve ever had. (Otherwise, I’m writing a complaint to Team Phil!) For now, I’m still on Team In-N-Out.